1. ONLINE – Choose your option below and pay securely online with credit card through PayPal. 2. MAIL – Print the PDF Friendship Form and mail it in with your payment. 3. CALL – (808) 661-3262 with your payment by credit card. with your donation – please add comments. Mahalo! is grateful for your online payment – please indicate type. Mahalo! Order a bench in memory of a loved one or to mark a special occasion for your family. With your donation, a handcrafted bench will be built and installed in Banyan Tree Park or Old Lahaina Prison Botanical Garden along with your personalized memorial plaque. Please add instructions. If you have any questions, please contact us first. Mahalo! 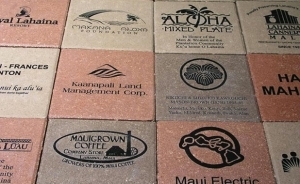 Join our many friends of the Old Pioneer Mill Co. Smokestack landmark by ordering a brick to memorialize your family, loved one or business and create a permanent legacy in Lahaina. Lahaina Restoration Foundation is a 501(c)3 nonprofit organization whose Federal Employer ID number is 99-6004506. All donations are tax deductible to the extent permitted by law. 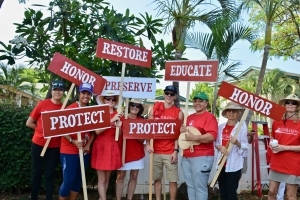 Please note: Lahaina Restoration Foundation does not share or supply personal information about our members or supporters to anyone for solicitation or other purposes. If you are receiving unwanted print or electronic material, please contact our Executive Director with details: 808-661-3262 or email us using our online form.